After the Japanese bombing of Pearl Harbor in World War II, Japanese-Americans living on the West Coast of the United States were rounded up and moved to one of ten different relocation centers throughout the country—including the Heart Mountain Internment Camp between Cody and Powell, Wyoming. In operation from August 1942 through November 1945, the population there numbered 10,767 at one time and was then considered the third largest city in Wyoming. Detained behind barbed wire in the shadow of Wyoming’s Heart Mountain, internees—uprooted from their homes and their jobs on the West Coast—looked to arts and crafts, hobbies, school, sports, and other activities to occupy their time. Beauty Behind Barbed Wire: Arts and Crafts from the Heart Mountain Internment Camp presented a representative collection of some of the arts and crafts created by internees from scrap wood, shells, and other found or discarded materials at the camp. For this exhibition, the Heart Mountain Wyoming Foundation loaned twenty-four arts and crafts objects to the Buffalo Bill Center of the West for the exhibit and another three items came from other lenders. Artifacts on display included wood carvings, jewelry, needlework, oil paintings, and a doll. With this exhibit, the Center of the West sought to call attention to the opening of the Interpretive Learning Center at Heart Mountain on August 20, 2011, and to honor the artisans who created the incredible pieces with outstanding skill and artistry. 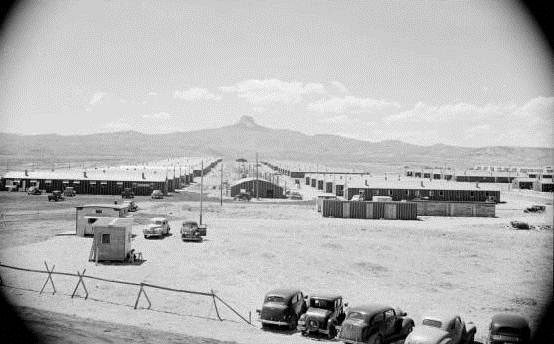 With the Heart Mountain Center, located adjacent to the camp, now open to the public, visitors can learn the complete story of the internment camp, of life behind barbed wire, and of even more arts and crafts made by the internees. Learn more at www.heartmountain.org.